Welcome to the world of alloy wheel repair. Alloy Wheel Repair Specialists is a worldwide franchise company specializing in the on-site repair of damaged aluminum alloy automobile wheels. 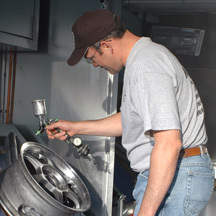 With over 150 franchises in North America, we are continually searching for motivated individuals who want to utilize their skills and make an above average income as wheel repair technicians. We pay a commission to our technicians so the amount that you can earn is unlimited. We also have a retirement plan. Our wheel repair technicians operate out of a Mobile Reconditioning Facility (MRF) and service car dealerships, pre-owned car lots, collision shops, tire stores, auto auctions, car rental agencies – any business that needs cosmetic wheel repair and straightening. The typical repair takes about one hour and the results are guaranteed. If you love cars, have the ability to work with your hands, like to deal directly with the customer and take pride in your work – you just might have what it takes to be a successful wheel repair technician. If this sounds like a career that interests you, complete the employment application form below. Click the link to download a pdf of the full job description.